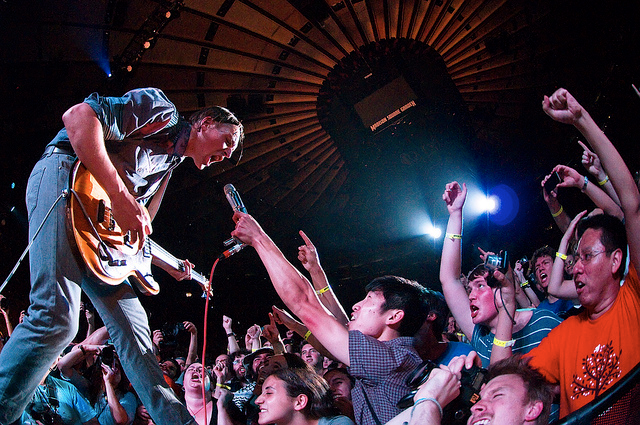 Arcade Fire streamed live at Madison Square Garden on August 5, 2010 in support of their third album release of The Suburbs. I have admired the music of Arcade Fire since their acclaimed breakout debut, Funeral. Seeing them play at Deer Lake Park in Burnaby during their Neon Bible tour still sits up there as probably the best concert I have ever seen. I enjoy their work as a true band of collective artists who have total control of their craft and the production of their music. Funeral is an incredibly daring listen, despite its depressing, downbeat themes. Neon Bible showed their incredible musical ambition with a wide-range of instrumentals exploring different artistic influences. With The Suburbs, Arcade Fire explores the breezy, feelgood nature of living outside the city and growing up in a nostalgic suburban lifestyle through interesting artistic flourishes. Every song explores a new breath of musical flavour and feel in such intriguing, dynamic ways. It is obvious the band of sometimes up to a dozen members took their time crafting another exploration, breaking new sound. Once again, Arcade Fire has compiled an eclectic mixture of songs and upping the track count to 16. This time around the songs feel breezier and more easygoing. Each song builds to a harmonic collective with consistent themes and lyrics that create a musical time line of growth and maturity. Watching their Madison Square Garden performance directed by filmmaker Terry Gilliam streamed live on YouTube, you witness their intensity and passion on stage. I love how the band members switch up playing different instruments. There is nothing more charming than when Régine Chassagne takes over on the drums. Despite all their acclaim, the band tries as hard as ever to stay true to to their own musical roots and ideals. The Suburbs is another entry (and their first #1 album) in what is sure to be a long line or interesting work.